The Service Design Network Ireland is happy to deliver to you the sixth Service Design Network Ireland meetup! Many thanks to Fjord for making space available for the event at The Dock. 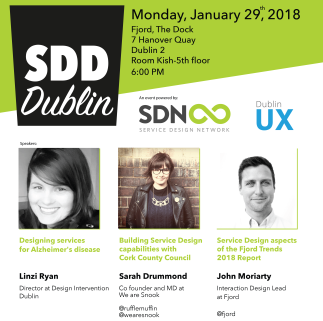 The Service Design Network Ireland and Dublin UX are happy to deliver to you the sixth Service Design Network Ireland meetup! Many thanks to Fjord for making space available for the event at The Dock. In Europe, dementia affects some 7.3 million citizens aged between 30 and 99 years of age. With the increase in life expectancy, the incidence of dementia is projected to double every 20 years. Alzheimer’s disease, the most common form of dementia is a terminal illness that develops slowly, causes memory, thinking and judgement impairment. It is a major cause of dependency and is estimated that on average three persons in every family provide some sort of informal care. This presentation details the service design process, challenges and legacy of the DSA project (Designing Services for Alzheimer’s disease) which aimed to allow people with dementia to extend the period of independent living, improve service provision and improve quality of life in a cost-effective manner. The project was possible due to the collaboration of multiple stakeholders, people with Dementia, informal Caregivers, HSE and the Alzheimer Society of Ireland. Dr. Linzi Ryan is an experienced product and service designer based in the West of Ireland. The recipient of Ireland’s first Doctorate in Product and Service Systems Development, Linzi also has a First Class Honours Master’s Degree in Product Design and Innovation and a First Class Honours Degree in Industrial Design. Linzi has worked with a broad range of individuals, companies and organisations designing products and services from early concept to product/service delivery for over ten years. She has also delivered a range of tailored Product/Service Training workshops for both the private and public sector using applied and practical tools. Talk: Making space for design: The unsexy service designer. Sarah Drummond, CEO of Snook will delve into the unsexy side of design on how the tussle for bringing user-centered design practice can be developed in Governments to corporate giants. From the perspective of both agency and organisation she'll share an overview and of embedding design inside Cork County Council, learnings from working with giants like Tesco and Snook's current work on helping Scottish Government with their digital-first service standard which ensures all digital services put user needs first and are designed accessibly. John will introduce Fjord’s Trends report for 2018. In particular John will speak about how emerging technology can impact the design of services in the near future. John is an interaction designer with 10 years' experience working in design consultancy, technology start-ups and digital education. John has held design leadership roles in Dublin and San Francisco where he has worked with companies in the consumer electronics, IOT, wearables, healthcare and education industries. John is currently an interaction design lead with Fjord, based in The Dock, Accenture's multidisciplinary R&D centre. His work here involves exploring new, human-centric applications for emerging technologies on behalf of Accenture and its clients.